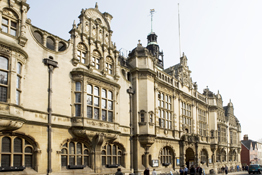 Join the Museum of Oxford as we take you on a tour around Oxford’s magnificent Town Hall. You will visit the Medieval Cellar, the Council's Court Room and the Council Chamber, plus more*. This is a unique opportunity to see the 'other' side of Oxford's history - you've seen the Gown, why not take a look at the Town? All money raised through our tours goes towards the development of the new Museum of Oxford. We know the cost of this ticket is more than the advertised price, however using this fantastic booking website comes at a cost. We are passing on the handling fee so that you have the choice to book in advance and avoid disappointment on the day. Once booked, please meet your guide and member of staff in the Micro-Museum situated within the Gallery in the Town Hall. Please print off your ticket if you can. If not, do please be prepared to show a form of identification. * the rooms visited on the tour are all subject to availability. The town hall is used for lots of different functions, so we can't always get everywhere we'd like to! These tours are suitable for adults. Although nearly all areas of the Town Hall are fully accessible for wheel chair users, please note that there are only steps down to the Medieval Cellar. We also offer tours for groups, please email [email protected] or telephone 01865 252417 with your enquiry.